Mazda's Philip Waring is the new chief operating officer of the carmaker's European operations. 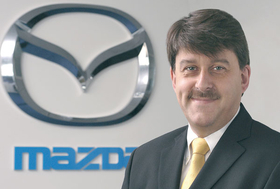 Waring, 51, a UK citizen, has overseen the Japanese carmaker's growth in Europe since he took charge of Mazda's European sales organization in July 2005. In his new role, Waring succeeds Masahiro Moro, who has moved to Mazda's head office in Japan to take up a senior global sales and marketing role. In 2008, Mazda boosted new-car sales by 9.8 percent to a record 342,800 in its European markets, which include Russia and Turkey. Sales in Russia grew 47 percent to 73,700 units to make the country Mazda's biggest European market. Waring will keep responsibility for sales and marketing in his new role. He said he is guardedly optimistic about the company's prospects for 2009.